It was the Virgin London Marathon over the weekend, which is always an amazing event. Thousands of people run for charities that are close to their heart and thousands turn out to cheer them on along the route. The week following the marathon is a timely opportunity for charities to thank their runners. It is also a prime opportunity to inspire people to sign up to run for them next year. Here is a fantastic video from Oxfam, personally thanking EVERY runner who ran the marathon for them. It is a brilliant example of how a video can be made on a shoestring budget yet be really powerful and effective. Another, quite innovative, video from Anthony Nolan (who are the official 2014 Virgin London Marathon Charity partner) encourages runners to sign up to run for them next year by giving runners in a local park a little taste of what to expect on marathon day. Both of these videos are not slick, expensive ‘corporate’ videos but rather short, simple videos using real people that bring a smile to your face and make you want to take action. I also recommend you read Ross McCulloch’s blog post: Your Charity’s videos are crap. Here’s how you can change that. Why, when tragedy strikes, does common sense goes out the window? Now, I love social media and champion it for the most part but when tragedy strikes where does everyone’s common sense go? We all need to take responsibility when something of this magnitude happens and resist tweeting and retweeting unreliable sources and spreading fear and speculation. And yes, even ‘eye witnesses’ can be unreliable. And it’s not just Twitter. I saw a photo on Facebook of the ‘8 year old girl who died in the Boston Marathon blast and who was running for Sandy Hook Kids’. Firstly, eight year old children cannot run in marathons and secondly it was actually a boy who passed away. I shudder to think of the repercussions of posting this young girl’s photo all over the internet and also how her family must feel, particularly extended family who have seen this and may now think she was a victim. And of course, my sympathies are with the three people who have lost their lives, their families and friends as well as the 140 or so people who are injured, many critically. I hope that, in time, they will heal. As we all know, in times like these, social media can be a great support system. Remember the London Riot cleanups organised on Twitter and Facebook? 1. Click on the account and look at what is written in their bio. 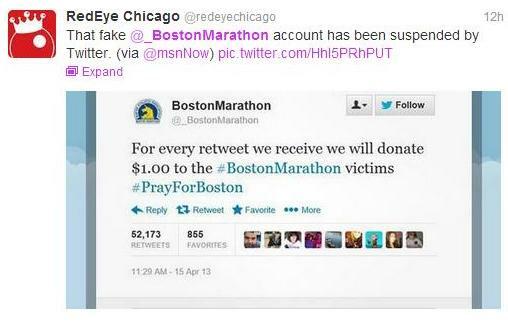 In the case of _@BostonMarathon they clearly stated they were the unofficial Boston Marathon account. 2. If it is coming from a well known charity/business/event it’s likely that they would have the blue verification tick to say that it is an official account. 3. Have they tweeted the same message to a number of people over and over? 4. Do they follow hundreds or thousands of people with few people following them back? By taking just a few minutes (or even seconds), you can help prevent spreading spam or untrue tweets. If you believe an account to be spam, please report it to Twitter. It got me thinking how simple it really is to say ‘thank you’ and how we probably don’t say it often enough. 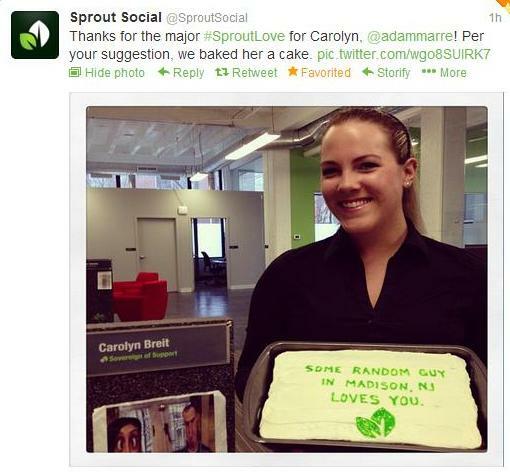 If you know me at all, you know how much I love Storify so of course I have collated some great ‘Thank You’ examples from charities – from photos, to Vines, to video. When last did you say ‘Thank You’?